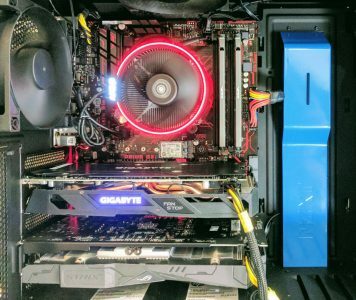 If you saw the 8 core/ 16 thread AMD Ryzen 7 release as an awesome opportunity for building hardware-accelerated virtual desktops with IOMMU, you were not alone. On the AMD X370 chipset motherboards, we were able to get multi-GPUs working. At the same time, if you are not going to be physically present at the system, it may be tempting to utilize a lower cost AMD B350 platform. Many of these B350 platforms cost under $100 so paired with a $329 AMD Ryzen 7 1700 with cooler, it is an awesome value proposition. We have a few B350 platforms in the lab and decided to try a multi-GPU setup. This particular setup worked with the Gigabyte AX370-Gaming 5 platform and booted into the OS without issue. On the B350 platform, it cause an AMD-Vi error before the system was fully booted. You will also notice we ran into a hard locking issue while trying to reboot the system, even though it is on kernel 4.10.1. We used the particular test setup below for the video, but this is not solely an ASUS B350 issue. We have B350 boards from three different vendors all exhibiting this issue. A lot has been made about AMD Ryzen ECC support at launch. Since we now have several Ryzen test platforms we are managing demos on, the discussion on ECC memory, at this point, is misplaced. There are a myriad of platform issues that still need to be ironed out, such as this AMD Ryzen B350 IOMMU issue, memory support, and OS kernel patching, before one will need to worry about ECC memory on the Ryzen platform. We do think that the AMD Ryzen platform will be a winner in the low-end 1P server market several months from now when the platform matures and we get appropriate motherboards (e.g. with iKVM and IPMI.) Although we do advise against buying these systems today for mission-critical services, we have told executives at AMD and multiple server vendors that these will be category killer 1P server platforms if a mature platform hits the market. So new platforms have bugs. You heard it here first, folks. Not just a bug but a disaster. I have the noted Gigabyte AB350-gaming 3 board. I traditionally dual boot Win 7 and Ubuntu Linux. Neither OS works on the new Ryzen system. As of now, Win 7 is utterly unable to be installed, even with a PS2 keyboard. You can get the OS installed, but it doesn’t see the ethernet. It sees the DVD drive, but is not able to install the official MS Win 7 cumulative update patch file from the DVD. It tries then returns an error saying the file is not correct for the computer. WTF? Ubuntu can’t be installed unless you add the kernel parameter acip=off. Then it works, but runs on only one core. It locks up when you reboot. Dual boot is totally hosed. Even Boot-Repair can’t fix it. I can forgive Ubuntu. But Microsoft really deserves the shaft. And I suspect that the mobo manufacturers and AMD are colluding with Microsoft on this. Win 7, which is still the most popular OS in the world, can absolutely not be installed on the new Ryzen systems. It takes incredible political and financial clout to pull off that kind of crap. AMD probably received all kinds of clandestine support for the Ryzen as a payoff for blocking Win7. Microsoft’s products are essentially public services, which means the government has authority to regulate them. Microsoft has monopoly control over something that is utterly essential to many people’s lives. The reasonable thing to do is put Win 7 and earlier windows versions into the public domain. Microsoft can keep Win 10. But then, to survive, they would have to develop it into a truly superior product to XP and Win 7. The reality is that Win 10 is NOT any better than either one for the average user. It’s actually slower, more bloated, and loaded with spyware. Only time will tell. But I wouldn’t be surprised if nothing gets fixed. Very easy to do but since it was an issue, we published that very early in our Ryzen coverage. Why would you use and support a proprietary, closed-source, spying-on-you, software? Just don’t use it. Linux is much better anyway. which IPMI Card did you use? GPU passthrough works on B350 chipsets?